An attempt to answer the question of Epistemic Elements which states "The two basic classes of elements that can undergo scientific change are questions and theories, where each theory is an attempt to answer a certain question, and method is a subtype of normative theory." Epistemic Elements - Questions and Theories (Barseghyan-2018) is an attempt to answer the following question: What are the fundamental epistemic elements that undergo scientific change? In this ontology of epistemic elements, theories are conceived of as attempts to answer certain questions. Theories can be of three types – descriptive, normative, or definitions. 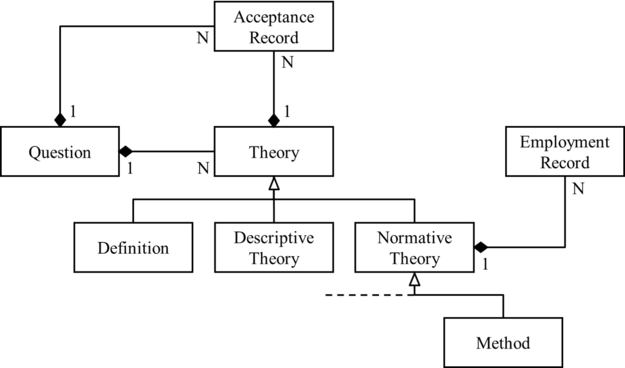 Method is understood as a subtype of normative theory. The ontology also posits that both questions and theories of all types – including methods – can be accepted. Finally, the ontology suggests that normative theories of all types can be employed. This page was last modified on 7 October 2018, at 18:36.